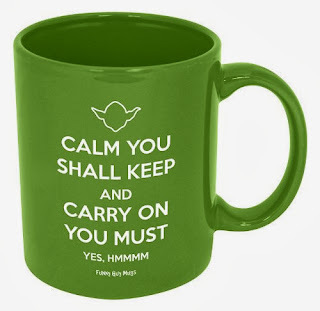 LOVE, love, Love this Star Wars Yoda themed coffee mug. Almost too late I am, discovering this handsome mug in time for Christmas. It is absolutely, positively perfect for the young men in my family who embrace all things related to the Star Wars movie franchise. It will also appeal to those who embrace the Keep Calm and Carry On theme which comes in as many variations as you can think of. "Calm You Shall Keep and Carry On You Must. This Yoda mug is a great gift idea for fans. We love that it is also affordable and practical. They'll use this coffee mug every day! Updated January 2, 2016: Unfortuntaely, this Yoda mug is hard to find. I've left the post up because I love the mug and it may return to the marketplace one day. Order this Yoda themed coffee mug from Amazon. Find a page full of Darth Vader gift ideas here. Find more Star Wars coffee mugs on Amazon.